To understand why "civil war" might be considered an appropriate term for what has occurred in Ukraine since 2014, don't just ask yourself whether or not Russian troops were/are present (they were/are, but that happens all the time in civil wars) or whether the case meets standard definitions from the community of cross-national IR conflict scholars (it does — there have been 1000 dead with 100 on the government side, the plurality of combatants were members of the same polity at the onset of hostilities, etc.). These questions may illuminate the wrong corners of the conversation. Consider also the following data visualizations. 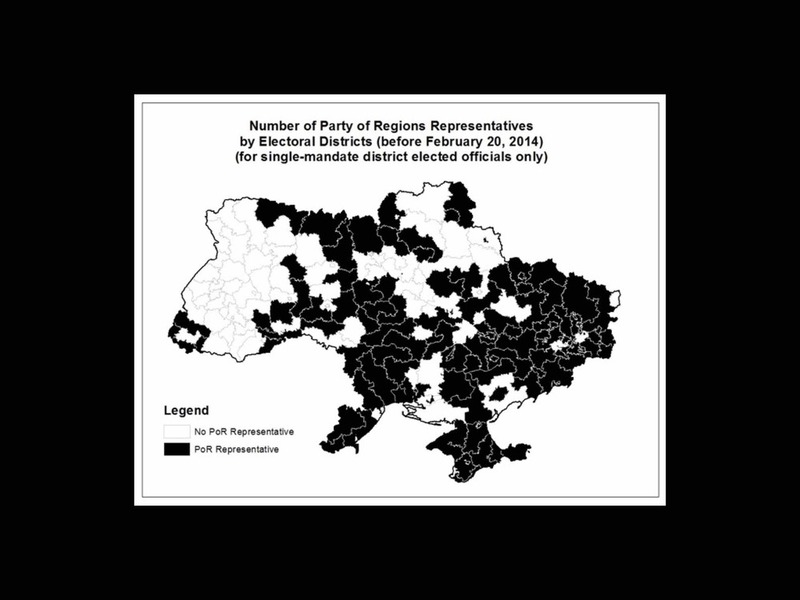 The first is a slideshow of maps, visualizing the disintegration of Ukraine's Party of Regions that occurred in the Ukrainian Parliament (the Rada) on February 20-21, 2014. 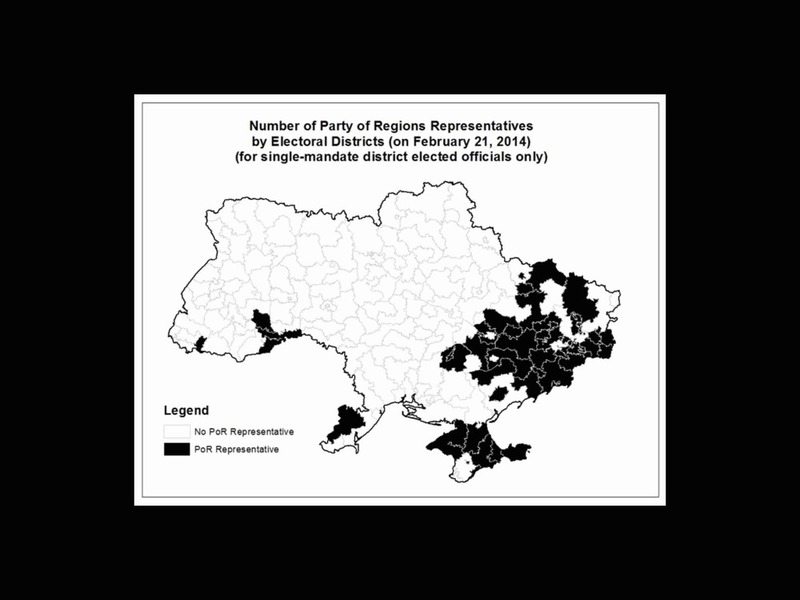 The Party of Regions was, in most relevant respects, a party representing "Eastern" interests, with only token representation in single-member districts West of the Dnieper River (the first slide). After the Maidan protests had escalated to a violent showdowns with armed protesters, there was a motion introduced onto the floor of the Rada -- a bill demanding that the police stand down and censuring the government for its role in escalating and provoking the crisis. The motion passed due to the defection of representatives from the West and Center (the second slide). Over the next night, there was a cascade of defections from the party. The map of the country still represented by Party of Regions representatives on the following day, February 21, is shown on the third slide. (Click on the map below three times to see the animation cycle. I like to imagine a tide receding to the East, leaving tidal pools of beached Russian influence in a new post-Maidan political reality). The second map shows voter turnout in the October 2014 Parliamentary Election. In addition to the obvious missing votes in Crimea and the Donbas Region, results suggested a crisis of representation in Ukraine's East. Thankfully there is, as of yet, little evidence that this extreme pessimism is warranted. This last map shows military deaths as a fraction of total oblast population on the Ukrainian side since the spring of 2014. A thick line surrounds the territory of historical Novorossiya, which, in defiance of early predictions (like the prognostication I published in my book!) is producing anti-invasion/anti-Putin martyrs at a rate that consummate with other parts of Ukraine. Correcting for per-capita population, as many Ukrainians born in historical Novorossiya, who speak Russian at home, are have died fighting against Russia as Ukrainians in the center and far West. So what has unfolded, in other words, is not the ethicized civil war that many are experts feared. Ukraine has come together, not split apart. Despite low voter turnout in the fall of 2014, an intra-Russkiy Mir civil war is raging on the territory of Ukraine. The master cleavage of the war, at least thusfar is not ethnic Russians against ethnic Ukrainians, as many feared. It is rather a politicized split between Russian-speakers who uncritically accept the premises of the Kremlin narrative and Russian-speakers, and other Slavic language speakers, that are inoculated against it. I am not sure who would have predicted that the largest dot would be the city of Dnipro. I certainly didn’t.